Water reuse needs rebranding. The terminology is complicated and varies city to city. And it often sounds unpalatable. (“Toilet to tap?” Nobody likes that.) Surely we can do better, and help people get interested in this critical issue. Water reuse is important in drought areas, but also in any location concerned about resilience of their infrastructure and adaptation to future climate change, which will bring water shortages to many regions. In short, water reuse now matters pretty much everywhere. Our Zero Water Waste projects use a range of conservation and reuse strategies. We’ve found that water is never simple: each project has slightly different drivers and water uses, different plumbing costs, and different codes that lead us to different reuse cycles. But they have one thing in common: in all cases, we start with what we call a “water balance,” where we identify and quantify every single water source and end use on the site. For each one, we first ask if we can use less. This might mean water-conserving fixtures, efficient irrigation, smarter kitchen water use, and so forth. Next, we line up our water sources and uses to find a cycle that matches up in water volume, water quality, has the smallest tank size, the shortest piping length, and the simplest health code impacts. We also look at several aspects of the water that might help our reuse cycle, such as water quality, seasonality, even temperature. We calculate all of this not on an annual basis, but a daily one; we need to understand when water comes into and out of the tanks to get an accurate picture. We rate how each option performance with respect to water resources, carbon/energy savings, cost, and complexity. And – voila! We now have a few options for water reuse to consider for the project. It’s important to note that water reuse is not just about stormwater, graywater, or blackwater for irrigation or flushing. Getting to Zero Water Waste requires looking beyond these fundamental reuse options. Many building types have specialized water uses that dwarf their domestic water use. For example, in labs we often have equipment to make perfectly pure water for experiments, and it creates pretty clean wastewater that’s ripe for reuse. Condensate is another one, where your climate and cooling needs might create a clean water source that’s available seasonally. Other project types have unusual maintenance water needs, special health considerations, and so forth. So when in doubt, we get to the bottom on any unusual water uses on site. Next comes the really hard work – getting the costing, space planning, and regulatory approvals in line. We see costs vary greatly across the country, often based in market familiarity with water reuse systems. Regulatory issues range from zilch to years of effort depending on jurisdiction. We see that most jurisdictions want conservation and reuse to happen, but they sometimes aren’t sure how to cover the health risks and create a compliance mechanism. We’ve been lucky to work with great progressive cities on these issues and pilot water reuse projects around the country. To help get everyone conversant in water reuse, we’ve put together a small primer. Read and enjoy! Zero Water Waste: Our term for a project that uses non-potable water for all possible non-potable demands, plus conserves water as much as possible. Try this term out on your next project and see if it helps the conversation. 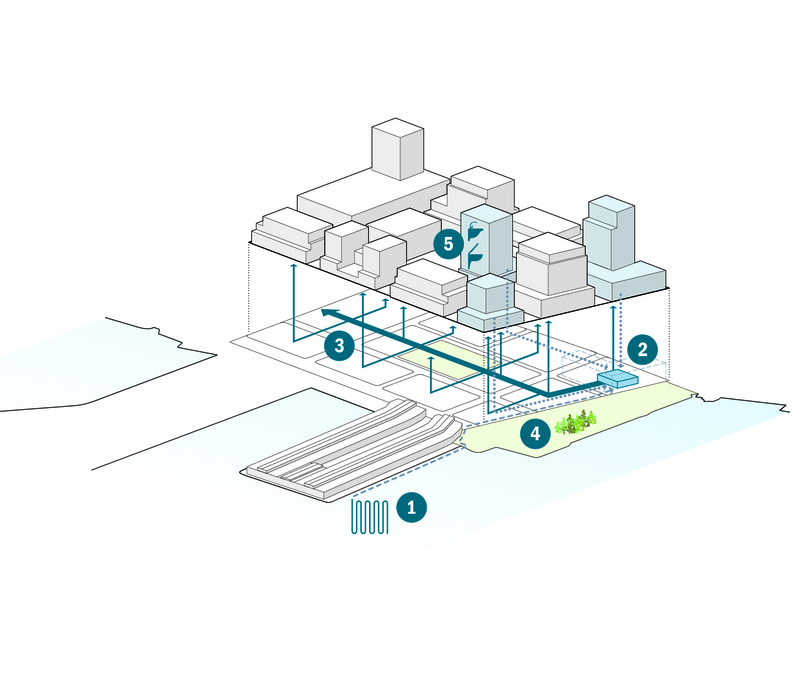 Net Zero Water: A project that produces as much water as it uses on an annual basis. People interpret this term in different ways: some believe that to be net zero water, you need to produce your own potable water so you are completely disconnected from the local water system. Some people think you can draw potable water from your utility as long as you provide the same amount of non-potable water to other sites. Some people think it’s important that this water cycle all occurs within your watershed; others include connections to larger utilities. The Living Building Challenge system has an evolving definition that we encourage people to use, so we’re all speaking in the same terms. 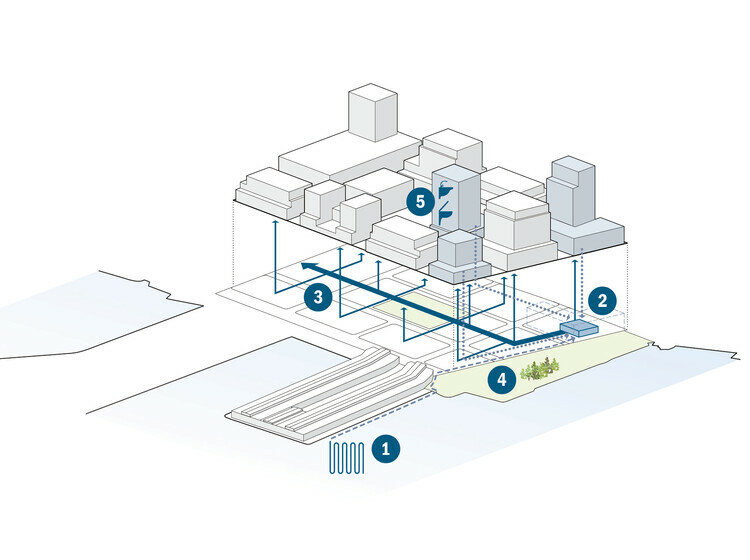 Process water: Water that’s used for specific needs within the building. This might be food service, laboratories, health clinic sinks, maintenance, etc. Process water is used as a general term to distinguish itself from domestic water and irrigation. Wastewater: This is a general term that could refer to any type of water after it’s used, including blackwater, graywater, or clearwater. Reclaimed water: A general term for water that has been captured and filtered for reuse. Non-potable water: Another general term for water that is not up to drinking water standards. Reclaimed water and non-potable water are often used interchangeably when discussed water reuse (though non-potable water can also refer to other water sources, like groundwater, that are not filtered to drinking water standards). Recycled water: A general term for water that has been captured and filtered for reuse. In some places, recycled water refers specifically to non-potable water supplied by a local utility. (In these jurisdictions, recycled water is non-potable water supplied by the city, while reclaimed water/non-potable water is non-potable water you make yourself.) When in doubt, ask your local jurisdiction so you’re speaking on the same terms. Blackwater: Everything that comes out of the sewer pipe. This includes toilets and urinals (flush fixtures), kitchen sinks, and other process water. Blackwater has a heavy organics load and harder to treat to a reusable standard. Lab, healthcare, or industrial blackwater has special considerations as it may need different treatment. Greywater: Water produced by showers, lavatory sinks, and laundry machines. Generally cleaner and easier to reuse than blackwater. Clearwater: Very clean wastewater including condensate, rainwater, and Reverse Osmosis (RO) reject water in labs. Very little treatment is needed before reuse. Stormwater: Rain runoff from the ground surface (parking lots, landscape, or hardscape). This has more contaminants than rainwater, though it’s often still quite clean depending on what it runs across before collection. Blowdown: Water discharged from a cooling tower once it’s been used too much and has a higher level of minerals and salts. Blowdown can be reused easily but the salt content needs to be considered for irrigation. Foundation Drainage Water/Dewatering Water: Water that is beneath the building that hits the foundation and is pumped away. Foundation water is often produced during construction and sometimes on a long-term basis. Raw Water: Water that is non-potable but not recycled water. Raw water might come from aquifers, from a natural surface water source, or could be from a water treatment plant before the treatment cycle. Rainwater: Rain runoff from roofs or terraces. Rainwater has few contaminants. Condensate/Fin Water: Water that condenses out of the air when it’s cooled by the cooling coil in an air handling unit. Condensate is extremely clean – almost as clean as distilled water. Purple Pipe: “Purple pipe” is a colloquialism used in California. It refers to the piping used to convey non-potable water through the site and building. California code requires that this pipe is painted a specific shade of purple (Pantone color #512, to be precise), so maintenance staff can distinguish it easily from potable water piping (blue), sewer piping (green), and flammable liquids (yellow) Hence, purple pipe.